I’d say all this is cause for some definite celebration, no??? I want YOU celebrating with ME at the launch party!!!! Are you in Chicago? Then join us for the official Calorie Accounting Book Launch Luncheon–nay, LAUNCHEON!–on Saturday, April 18th at the fabulous Mars Gallery in the West Loop! We’ll do a little reading, a book signing, Q&A with the Author, maybe some Bozo Buckets, who knows?! Come celebrate and toast to the end of your love handles! 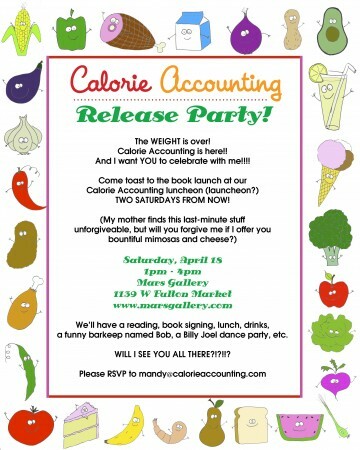 RSVP to mandy@calorieaccounting.com! Hope to see all you ex-porkies soon! The Weight is Almost Over!